These handmade wrought iron stands offer a beautiful way to display Stephen Kitras' signature glass globes. You asked and we listened! Inspired by our customers' suggestions, these wrought iron stands are a beautiful way to display artist Stephen Kitras signature glass globes. Simple swirls and a circular base in heavy iron are a lovely complement to the delicate and intricate glass globes. Available in one-globe (at right) or three-globes (at left). Handmade in Canada. Click here to see Stephen Kitras' glass globes. Please note that globes are meant to be hung with a loop made of anything from ribbon to fishing line. (Using ribbon with complementary color really accents the colors on the globe!) Please also note that direct sunlight and heat can wear out certain types of ribbon - so be sure to replace this as needed. 1-globe stand: 14.25" H x 6" diam. ; 3-globe stand: 16.5" H x 9" diam. Paint is rust-resistant; clean with dry cloth. Not shown to scale - please see measurements. Globe shown on left is not included. I received this stand to hold a beautiful aquamarine tinted glass ball. Even though the ball is10.5" around and hangs down almost 5", the stand is too tall. It's a bother to return, so I guess I'll try to find a coordinating color ribbon to help it hang lower. From past experience I trust this display stand to hold my glass tree globes. This is very heavy, sturdy and attractive. This was given with a 6 inch Kitras Globe to a coworker in memory of her mother. The colors that are emitted when the sun hits will serve to remind our friend she was thought of at a sad time. Her mother loved pretty pieces of art and this too keeps her mom in her heart when she looks at this work displayed in her home. Beautiful stand for fragile bulbs! Displays the glass globe perfectly! 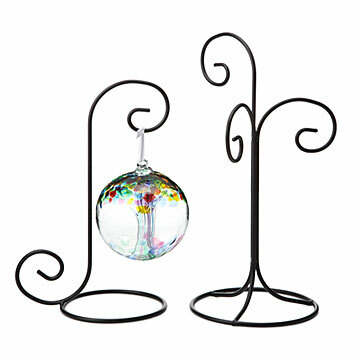 I bought the the three holder ornament stand to display my Swarovski Ball Ornament Series. The ornaments fit great on the stands, and the stands fits perfectly on my fireplace mantle. The stands are very sturdy and you don't have to worry about them accidentally being knocked over. I love them so much I will probably keep them displayed all year long. Soo many oos and awes!!! I am getting one for myself next!